When it comes to the App Store, to-do list apps are littered underfoot like so many dead leaves. Each, it seems, is trying to outdo the others in how many bells and whistles they can offer, vying for their chance at a spot on your Home screen. Warmer: Clear's lists are coded by with a simple heatmap metaphor reflecting priority..
Clear—produced as a collaboration between Realmac Software, Milen Dzhumerov, and Impending—seems to take delight in the very opposite. The $1 iPhone app, released on Wednesday, sports a simple, no-frills interface that’s about as basic as you can imagine: There’s no syncing between your devices, no location-aware reminders, not even due dates or notifications. Upon first launch, Clear quickly steps you through the process of using the app—a good thing, too, since it’s almost entirely controlled by gestures. However, all those gestures are ones that iPhone users are well acquainted with—swiping, pulling, pinching, tapping, and so on. There are three levels of hierarchy in the app. At the very top is a menu, which contains My Lists, a variety of themes to choose from, a set of tips and tricks to refer to, a list of the developers and designers behind the app, and the program’s meager settings. In the last, you can choose whether to enable or disable an app badge (which will display on the app’s icon how many overall to-do items you have), a contextual badge (which will only display the number of items in the list you last viewed), the app’s sound effects, and the vibration feature. That Pinches: Creating new items can be done in a variety of ways, including by pinching items apart. Tap on My Lists in the menu, and you’ll drill down to the second level where your lists live. Next to each list is a number showing how many items it contains (excluding completed tasks). You can create a new list in one of three ways, depending on where you want it to appear. To create a new list at the top, swipe downward on the screen and release; you’ll see the top of the screen flip over in the same faux-3D fashion that iOS 5’s banner notifications appear. To create an item at the bottom of the list, simply tap anywhere below the last list. 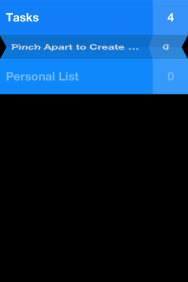 You can also create a list between two existing lists by placing your fingers on those two lists and performing a reverse pinch gesture. In any case, type in your list’s name and you’re all set. If you decide you’re better off without a certain list, swipe left on it to delete it. (If the list contains uncompleted items, you’ll be asked to confirm that deletion.) You can also swipe right on a list to complete every item on it. To view the items on a list, just tap it. Within your lists, Clear uses a heatmap metaphor to display your items; they start at a particular color and get lighter and lighter as the list continues, in a sort of implicit priority order. 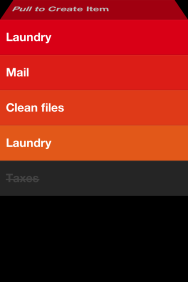 By default, Clear uses hues of red, orange, and yellow, but you can choose a different theme in the top-level menu. Pull! : You can also create new items by pulling down on lists. Creating a new to-do item can be accomplished in the same ways as new lists—by pulling down on the list and releasing, tapping in the spot below the last item, or pinching two items apart. As with lists, you’ll be asked to enter the name of the item; once you’ve created it, you can drag it anywhere within your list and Clear will automatically assign it the appropriate color. To mark a list item as complete, it’s a simple matter of swiping it right; it’ll flash green and slide to the end of the list, where the text will appear struck through and grayed out. If you’re a little premature in crossing an item off, just swipe it to the right again, and it’ll be reinstated. If you want to delete an item entirely, swipe it to the left, and it’ll vanish. But be careful: You can’t return a deleted item to life. To remove all your completed icons, just swipe up on the screen and Clear will—as its name suggests—clear those items from your list. To navigate back to a higher level you can either scroll down on the screen—make sure to go past the point of creating a new item—or you can perform a pinch gesture on the items in the list. It’d be remiss of me not to mention Clear’s sound effects, which are simple but effective beeps and chimes that give you feedback on the actions you’re taking. For example, as you cross items off your list, Clear will play a single note—complete a bunch of items in a row and each time Clear plays a different note. Complete a bunch of items in order and you’ll realize that it’s actually a scale. If you’ve enabled Clear’s Vibration feature in the settings, you’ll get a little buzz with each one. At first blush, Clear may not look like your typical iOS app, but in some ways it’s the archetypal iOS app—simple, elegant, and entirely fluent in the gestures that Apple’s mobile operating system pioneered.